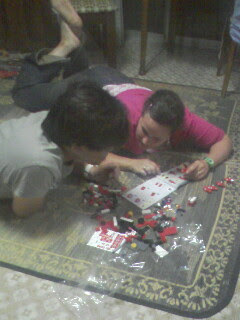 Here's a pic of me and Shoichi happily doing Lego together. Awwwwwwwwww! We are such dorks! (but happy dorks). We'll probably go out and get more Legos soon, this looks like it might be the start of a serious addiction. Yesterday Shoichi and I went to the Kobe Porto Bazar (only one A for some reason) outlet mall and we got Legos! 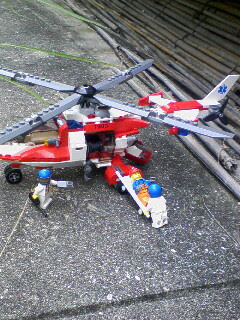 I got the awesomely realistic helicopter you see above and Shoichi got a Ferrari race car pit-stop set. Pretty sweet!